In the past few months I discovered that the Cross House was lighted by gas/electric combination fixtures throughout. 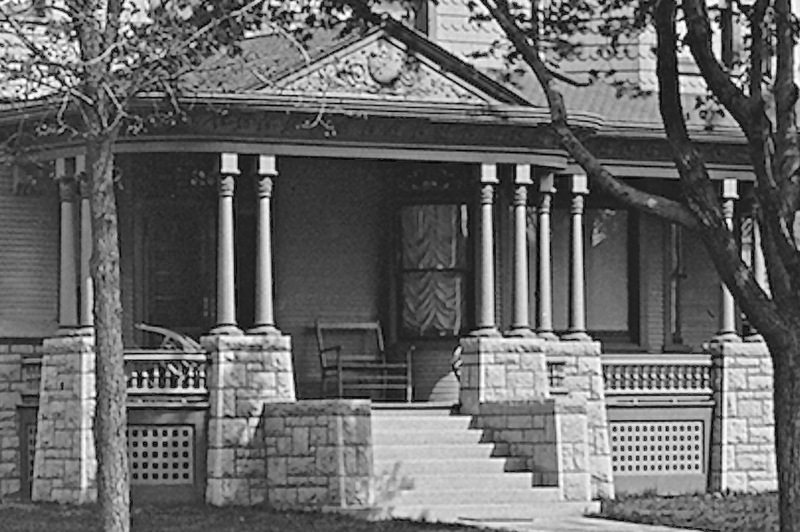 This means that the 1894 house may have been the first in Emporia, or one of the first, to have electric lighting. This is all way cool. But, what lighted the front porch? This is the Cross House front porch when brand new. What lighted it? Image: Walter Anderson Collection ESU Archives. The stained glass panel above the double entry doors lighted up (and still does). But this would not have offered much light onto the porch. I am assuming that there was a fixture attached to the wood ceiling of the porch. Would this have been gas/electric? Or gas? Or electric? Soon, the shingle roofing on the porch is going to be torn off. When the wood sheathing is exposed, I am going to cut a hole into the sheathing, so I can crawl into the attic of the porch. If there was gas/electric porch lighting, the evidence should still be evident: a gas pipe, and adjacent knob and tube wiring. I am eager for this exploration. If there was a ceiling porch fixture, would it have looked sorta kinda somewhat like this gas/electric combination pendant? If so, what kept the gas flame from blowing out during high winds? Circa-1955. 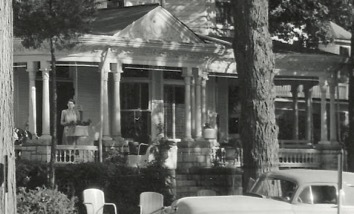 The house was now the Palace Motel (New & Modern!). Note the front porch. See the thin horizontal white lines between the column tops? I think those are neon tubes. Image: Mouse family archives. Circa-1970? You can see that there were no sconces. And the presumed neon tubes are gone. There appears to be some sort of ceiling fixture although it would certainly not be original. Multiple mail boxes are on the wall to the right of the doors (the house was now divided into many apartments). 2016, yesterday. Currently, there are a pair of sconces on each side of the entry doors. The previous owner installed the electrical boxes. I purchased a pair of circa-1910 cast-iron fixtures but only installed one. I knew it was not quite right, and was reluctant to proceed with installing the matching fixture. So, this is how things have remained. Yesterday though, I removed the sconce. I also removed the electrical box to the left. I could fill in the hole through the siding but it will always look like a repair, so I will replace the damaged siding. I will also remove the box on the right, as well as the curious electrical boxes above. This damaged siding will also get replaced and painted. Thus, the walls to each side of the entry doors will, once again, be sconce-less, as they originally were. Only the bronze historical plaque will remain. With the sconces removed, the porch is going to be dark at night, although the stained-glass panel will really pop! I still assume there was a ceiling fixture, and am hoping The Exploration will reveal some answers. I am also hoping that readers might know some answers! Hi Ross. 🙂 I know of and support your mission to put things right at Cross House. 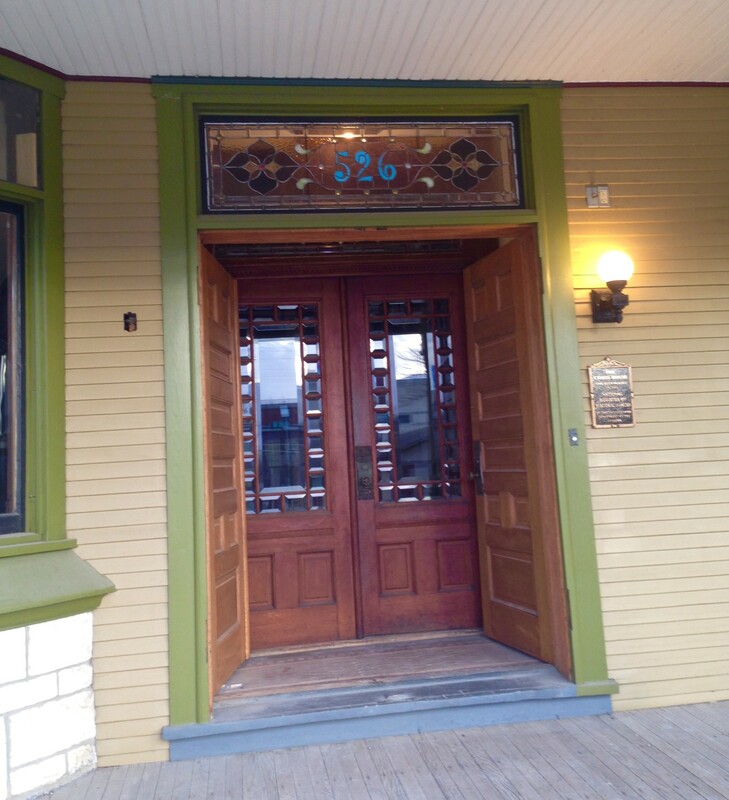 Just my thought – I like having the lights on either side of the door, even if they wouldn’t have been original. I like having good lighting around the entry door so that I can see who is out there, on a dark winter’s night; I also like that my home’s front door is lit up enough that no one gets the idea that they can break in without being very clearly seen by a neighbor, etc. So, what about getting & installing fixtures that you love for the sides of the front door? As well as a ceiling fixture, if there was one. For me, (and of course, my opinion doesn’t really matter) function triumphs over being a purist here. Do you know that at age 50 we need twice as much light to be able to see what a young’un can see? Light is our friend, as we age. My house was built later than yours – 1904 – so of course the lighting situation and aesthetic was different than when Cross House was built. 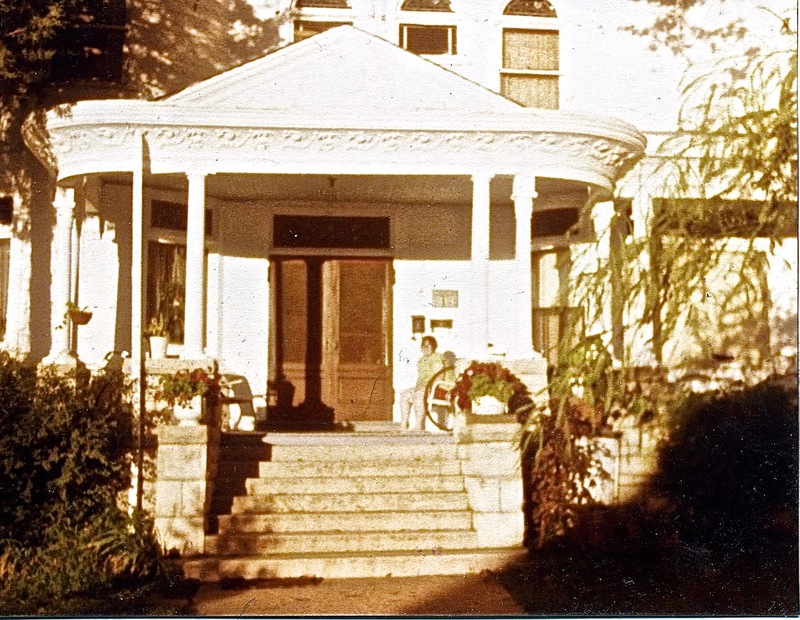 Originally there were no light fixtures on my columns at each edge of the front of my home. Detective work revealed that they were wired in in the 20’s, allegedly because Mrs. Lyons (the original owner) liked to garden into the evening; I have thanked her numerous times through the years, as I too, like to garden into the night, and those lights help me do that, as well as welcome folks to my door in the dark. Just my thoughts. Neon tubes would, indeed, be crazy on a private residence. But the Cross House was converted into a motel in 1950, and neon was common to motels of the era. From what I know of good manners during the time your house was built, prime visiting hours would have been in the afternoon; evening was a time to spend with family. It would be very unusual for anyone to come calling to the front door after the sun had gone down. It’s entirely possible that the house would have had a fixture to light up the stained glass above the entry, but no lighting (especially gas lighting) on the porch ceiling. It seems like you constantly discover something new, surprising or wonderful about the Cross House. It will be interesting to hear what you discover from your detective work above the porch roof. Yes, the vestibule (between the two sets of entry doors) did have a gas/electric ceiling fixture, and this lighted the stained-glass above the doors. But until I can access the porch attic (soon! soon! ), I am only guessing that there was also a porch ceiling fixture. If there was a porch pendant, as we have discussed offline, it would almost certainly have been made of black wrought iron, in the leafy/scrolly/ruffled lantern-with-opalescent-glass style popular at the time, and now virtually forgotten by most pre-1910 home owners. These were made well into the 1910s, and are often dated earlier than they really are. The simpler the design, generally the later the date. They were offered in gas/electric combos also. The opalescent glass could have had the swirls or could have been plain (or pearlescent as it was sometimes called). In rare cases the glass was straw opalescent (vaseline) or even colored. WAY cool, Bo! Thank you!!!!!!! All the fixtures seem gas (originally). Might you know of any gas/electric examples? Always an adventure to be had at the Cross House. This is off-subject, but your massive oak or oak-grained solid front doors remind me of a phrase still in use in Oxford and Cambridge universities where the older rooms in residence halls have double doors–the outer, solid one is oak, and the inner one for daily use is lighter. When the outer door is closed, a don or a student is said to “sport his oak” and not be at home to visitors. Thus, when Ross sports his oak, he is not receiving. That is a wonderful story! Thank you! I smile at: Ross sports his oak. It is my understanding that when the Cross House was built, if the outer set of solid doors were closed, this meant that the family was not receiving. When the outer set was open, revealing the glass inner set, the family was receiving. I’m excited to see what you find. I don’t find the sconces offensive, but an authentic ceiling light could be very cool. I may seek your expertise on locating an appropriate porch ceiling light for our home (1912 Foursquare). It’s currently a very crappy hardware-store special, and when I finish restoring the porch, there’s no way I’m going to leave it there. You have not met Fussy Ross.